I read Henry's The Night She Disappeared last year and really enjoyed it, it was a brilliant fast-paced mystery thriller . So, as you can image I was excited when I heard about TGWwStD. Even though I didn't like it as much as TNSD it was still a great page turner! The book opens with the mc, Cady waking up in a cabin with no memory of how she got there or even of who she is. There has been a influx of YA books dealing with memory loss, and of the ones that I have read none of them have really worked for me. Henry managed to pull it of, though. The writing style was simple, yet effective - the short chapters and sentences helped to create an edgy and tension filled atmosphere. On her journey to find the truth and regain her memories she meets Ty, a fast food restaurant employee, who helps her. As with her previous YA standalone Henry has created two very likable and realistic characters that are easy to root for. 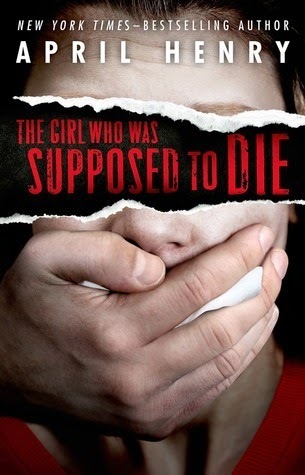 The Girl Who was Supposed to Die has a cinematic feel to it, the plot is full of twists and turns and there is non-stop action. All in all, TGWwStD was a quick, one-sit read that I would definitely recommend to people on the look out for a YA standalone! I have this one! I was actually thinking about reading The Night She Disappeared first (I know they're not related, but people say it's April Henry's other book that's mystery). But I think I might read The Girl Who Was Supposed to Die first, since I have it. I like the fact that this is a stand alone, but no one is overly thrilled with this one. It seems to be missing a bit of something. I think I will try this author's other book first. Thanks for your honest review, I am glad that for the most part you enjoyed this one, Renu. I'm the opposite of you. I didn't like The Night She Disappeared AT ALL but LOVED this one!! such a great mystery. I didn't care for this one as much as her other books either. I agree that it probably would have made a better movie than it did a book. Enjoyable, but it wasn't spectacular. This one looks absolutely chilling and fantastic! I shall consider this one now. I haven't read the first one, but I love dark, realistic stories, so now I've got both of these books on my TBR. I have to say that cinematic books are very hit or miss for me. If they rely too heavily on the fade-in, fade-out type of details and move too fast without explanation, I struggle. That said, I'm definitely intrigued! Great review! I am definitely searching for a one book thriller! Fantastic review! This sounds great! I admit I hadn't heard of it before - so thanks for turning me on to it. I love these sort of thrillers that have a cinematic feel - it's always fun. The writing sounds most excellent, as well. Nicely reviewed. Awesome - I've been looking for a short stand-alone story and you just gave me a title. Thanks a lot, Renu! Ohhh now this sounds interesting. I may have to check this one out. super review, Renu. I hadn't heard of this one before, but it sounds like a good standalone. May pick it up.